Safe House – Housekeeping With A Vengeance! 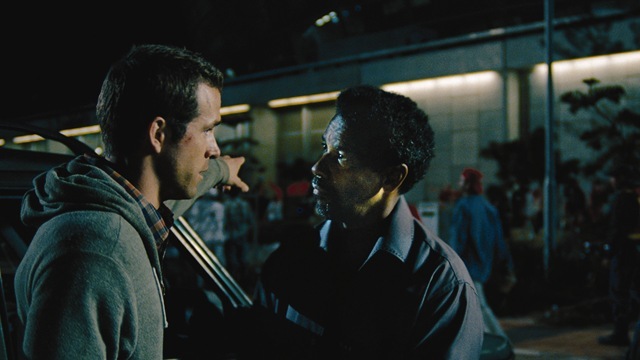 After Green Lantern, it’s a pleasure to see Ryan Reynolds matching wits [and chops] with Denzel Washington – who seems to be joining Liam Neeson as a middle-aged action star – in a movie that is actually the kind of taut, suspenseful thriller that is as smart as it is violent. Matt Weston [Reynolds] is Housekeeping, which is to say that he’s the guy who runs a CIA safe house that may never be used. He’s been there for an uneventful year and itching for a promotion. His girlfriend, Ana [Nora Arnezeda], thinks he works in a hospital. Tobin Frost [Washington] is a former CIA agent who went roué nine years ago and is wanted for treason. After meeting an MI6 agent to obtain a microchip, the two are attacked and Frost evades death by ditching his weapons and getting to the U.S. Embassy, from which he is taken to a safe house. Weston’s safe house. Shortly after an interrogation team arrives [can you say waterboarding? ], the safe house is invaded and the interrogation team killed – leaving Weston and Frost on the run. Directed by Daniel Espinosa, from a script by David Guggenheim, Safe House is a combination of brutal action, crackerjack chase sequences and the battle of wits between Weston and Frost. And since Frost wrote the security protocols which Weston is ordered to use by his handler – David Barlow [Brendan Gleeson] – that should put him at a distinct disadvantage. First does get away, but while Weston might not have any field experience, he’s been paying attention and sets out to get Frost back – an action that has another CIA case officer, Catherine Linklater [Vera Farmiga] convinced that he, too, has gone rogue. Barlow is convinced of exactly the opposite and their disputes are refereed by Director Harlan Whitford [Sam Sheperd]. Weston not only has to chase down Frost, but manage not to get himself killed – all the while pondering some salient questions posed by Frost – designed to get inside Weston’s head, they are also extremely good points. Frost and Weston make an unlikely pair, whether as opponents or teammates. Frost is a genius at what he does – he gets into Weston’s head even before Weston can try to keep him out; Weston is a bored low-level employee, spending his days bored out of his mind before a wall of computer monitors. Frost has been there, done that and rewritten the book on it; Weston has barely read the book. And yet… Weston is both surprisingly resourceful and the guy who actually paid attention in hand-to-hand combat class. He manages to do a lot with the little he has to work with – more than the battery of folks in Langley with all the computers and experience. It might be a no-brainer to figure out that Frost’s microchip is the McGuffin that provides the impetus for the action, but not who it affects directly or where they are coming from. The folks who attacked Frost and the safe house fit into the puzzle in a manner that might be expected, but maybe not. There are levels within levels here. Espinosa does a good job of making minor characters feel real – kind of like Stephen King does with characters he wants us to like before he kills them off. It helps that Gleeson, Farmiga and Sheperd deliver the kind of matter of fact performances that feel natural – even when they’re not, really. The result is that we can’t be sure exactly who’s on whose side, or why – which makes for a great ride. Previous PostCoriolanus – Before Him He Carries Noise; Behind Him He Leaves Tears!Next PostFOX Releases Spring Schedule: Bones Returns April 5th!